‘It is a tragedy when the human spirit dies before the body. But the answer is not to kill the body too, but to revive the spirit.’ So said Prof Margaret Somerville at a conference on euthanasia held in Wellington a couple of years ago. On Sunday I tried to canvass the arguments on both sides of the euthanasia debate, respectfully, but being clear that I think legalising euthanasia will have far-reaching unintended effects and is a poor solution to the problem of end-of-life suffering. It’s important to acknowledge up front that everyone arguing for or against legalised euthanasia is on the side of reducing human suffering. We just disagree about how to do it – and what effect on human suffering euthanasia will actually have. If you have been in a distressing situation as someone has been dying, I am terribly sorry that you had that experience. 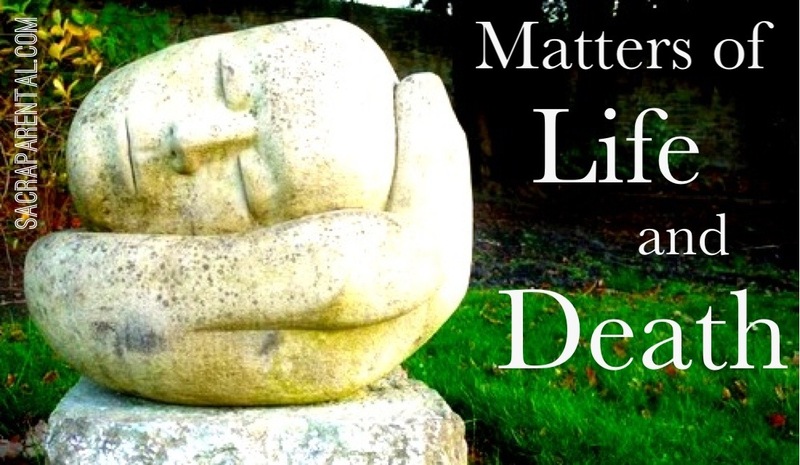 Unlike some of the others in this series of Matters of Life and Death, this post is not primarily about our personal responses to death and dying, but about public policy. If you are interested in a more personal approach and spiritual resources for difficult situations, you may like to see the posts on disability and dementia. I sincerely believe that those who come after us will wonder why on earth we kept a human being alive against his will, when all the dignity, beauty and meaning of life had vanished; when any gain to anyone was clearly impossible and when we should have been punished by the state if we had kept an animal in similar conditions. You may be surprised to learn that very few people who request euthanasia are doing so because of physical pain. Only 7% in one Oregon study, and none at all in an Australian study. And a Dutch study showed that half of all people requesting euthanasia were clinically depressed. The suffering that many people experience at the end of life is not the physical distress we often think of when talking about euthanasia but existential distress. If someone without a terminal illness was similarly distressed about things like fear of death, regret or depression, we would respond with treatment, not euthanasia. Indeed, a Canadian study found that rather than euthanasia, a very effective response to such requests, along with medical treatment of depression, was what they called ‘dignity therapy.’ It’s a specialised psychotherapy where volunteers listen to and write down a person’s life stories, then present them to the person to bequeath to their loved ones. Dignity therapy, in one study, halved the rate of requests for euthanasia. Many people just need to be listened to and know that their lives have significance. When we encounter someone near the end of their life who is distressed in any way, we need to respond, as a society, with friendship and good medical care, rather than euthanasia. The next biggest argument is definitely about freedom of choice. Shouldn’t people be able to choose and control when and how they die? This a modern argument in its popularity – it’s only recently that human beings have felt like they control their destinies. In the rich world at least, we now get to choose our marriage partners, jobs and homes in ways our ancestors never imagined. So shouldn’t we extend this freedom of choice all the way to the end of our lives? Leaving aside for now the Christian response that, actually, no, we’re not intended to have that much control, I’m not that interested in using the law to limit people’s freedoms when they don’t affect other people. But in the case of euthanasia, one person’s freedom is another person’s shackle. Euthanasia requires someone else to be involved in causing a person’s death. It means that family members and doctors are called upon to assume the burden of killing a loved one or patient. Medical associations around the world are strongly opposed to euthanasia for this reason, as is the Hospice movement. It would fundamentally change the basis of the doctor-patient relationship, undermining trust. Some people do want the freedom to choose when and how they die, but we all have our freedoms limited by the state for the sake of others. I’m convinced that euthanasia takes away more freedoms than it gives. No one wants to be a burden. But that’s the problem. Legalising euthanasia is very likely to lead to some people feeling an obligation to exit early for the sake of their caregivers and loved ones. We concluded that it was virtually impossible to ensure that all acts of euthanasia were truly voluntary and that any [law change] could not be abused. We were also concerned that vulnerable people – the elderly, lonely, sick or distressed – would feel pressure, whether real or imagined, to request early death. It’s a hard thing to be a burden to your loved ones, but learning to bear one another’s burdens brings life. If an ill or elderly or disabled person feels like a burden, surely the answer is to value them properly, not to kill them. Euthanasia is a poor substitute for cherishing the weaker members of our society – and letting them know they are cherished. It’s a terrible thing to watch someone you love die. I think I can understand the impulse to help them end their life before nature does. But this kind of law change can’t be motivated or justified by the distress of the well – especially when that distress is often out of proportion to the experience of the person who is actually dying. Even in the Netherlands, where euthanasia is readily available, and reported deaths by euthanasia make up around 3 per cent of all deaths each year, the majority of people still do not choose it. Most people, even in the Netherlands, would rather that the time and method of their death be out of their hands. So who are we as onlookers to say that their end of life is too distressing? Surely rather than legalising euthanasia, the answer is to increase support for families, so that we are all able to be sad, but calm, presences around the beds of our dying loved ones, rather than anxious ones. We need to deepen our inner resources so we are able to accept death, which is, after all, inevitable, and even with euthanasia, usually out of our control. I’m not a fan of slippery slope arguments, which are often a combination of lazy logic and scaremongering. We have, however, seen enough evidence from the places where euthanasia is now legal to be seriously concerned about the unintended consequences of legalising euthanasia. If you asked most people to describe an imaginary scenario where they wish euthanasia were legal, they would probably talk about someone past middle-age, in the last stages of a terminal illness, in unbearable physical pain, asking a doctor to give them a lethal dose. Yet, not only are most people requesting euthanasia not in physical pain, it’s also true that since euthanasia was legalised in parts of Europe, targeting that kind of scenario, a lot of people have been killed in circumstances that are very different. The safeguards in legislation are largely ineffective in Europe. For instance, both Belgium and the Netherlands have, on paper, strict rules on mandatory reporting. But in the Netherlands, officials estimate that over 20 per cent of cases of euthanasia remain unreported, and in Belgium the figure is more like 50 per cent. More importantly, both countries’ legislation requires voluntary consent by the person who wants to die. But in the Netherlands, 14%, or one in seven deaths by euthanasia are now without consent or an expressed desire for it. In Belgium, 32% of deaths by euthanasia happened without a specific request. For a full analysis of how well – or poorly, in fact – the safeguards are working around the world, see this paper. Here are some key examples of how euthanasia is now practised in places it has been legalised. It’s not at all what most of us could have imagined. The Groningen Protocol is an accepted medical practice – not legal under the euthanasia laws, but openly practised and no one has been prosecuted – whereby severely disabled Dutch babies are killed at the request of their parents. Doctors in Europe now perform euthanasia on middle-aged people in the early stages of dementia. In Belgium, the parliament is debating extending euthanasia to those under 18. In two widely-reported Belgian cases, people without a terminal illness have died by euthanasia because they, essentially, thought they had nothing to live for. Have a look at the circumstances. The people involved would be described as suicidal if euthanasia weren’t an option. Belgian has also seen cases of euthanasia for blindness and anorexia. Add to these examples the concern that people will be coerced, or feel imagined pressure to choose euthanasia, and it becomes extremely difficult, nearly impossible, to limit deaths by euthanasia to the kinds of last-resort scenarios that are initially targeted by legislation. The other problem that has been identified in the Netherlands is that once euthanasia is legal, it’s possible to argue that withholding it is unfair or cruel. This is one reason so many people in Belgium and the Netherlands are killed without their consent – how could doctors let them suffer? Over the past two decades, the Netherlands has moved from assisted suicide to euthanasia, from euthanasia for the terminally ill to euthanasia for the chronically ill, from euthanasia for physical illness to euthanasia for psychological distress and from voluntary euthanasia to non-voluntary and involuntary euthanasia. Once the Dutch accepted assisted suicide, it was not possible, legally or morally, to deny more active medical assistance to die (euthanasia) to those who could not effect their own deaths. Nor could they deny assisted suicide or euthanasia to the chronically ill who have longer to suffer than the terminally ill or to those who have psychological pain not associated with physical disease. To do so would be a form of discrimination. In New Zealand, Labour MP Maryan Street has drafted the End of Life Choice Bill. She withdrew it from the Private Member’s Bill ballot last month (so it’s not on the Parliament website anymore), to stop it being debated in an election year. She has said she will reintroduce it as soon as the next Parliament convenes, if she is still an MP, which seems likely. The safeguards it provides include requiring that two doctors sign off, the requests be in writing, a one-week stand-down period between request and action, and mandatory reporting. This is a relatively relaxed approach, compared to the European regimes. The Bill allows anyone with an ‘irreversible physical or mental medical condition’ that causes unbearable suffering – in their own view – to access euthanasia, a wide enough definition to include those with dementia or depression. Dementia is specifically intended to qualify, according to Ms Street. The New Zealand Medical Association has clarified that despite any law change, euthanasia will remain an unethical medical practice. I heard a radio commentator talking recently, just off the cuff, about the prospect of legalising euthanasia in New Zealand. She seemed to categorise the issue alongside a basket of other socially liberal policies, like decrimininalising homosexuality and prostitution. She thought it was just a matter of time, and soon lawmakers would legalise euthanasia. Once again this death raises the vexed issue of euthanasia and, as I have recorded in past cases, this process simply will not go away, and it will be necessary for Parliament to address this matter yet again. Given that bills attempting to legalise euthanasia have come to Parliament twice in the last two decades, and been defeated, the Coroner, too, apparently thinks that it is inevitable that it will be legalised, part of a social tide of liberalisation. I disagree. I think there is a great deal of misunderstanding about the issue. Far fewer terminally ill people want euthanasia than we may think. Far more people are at risk of dying against their wishes than we may realise. Euthanasia would undermine the doctor-patient relationship and probably make us less compassionate towards disabled, elderly and ill people, not more. Legalising euthanasia would almost certainly cause more suffering than it would relieve. Society would not become more free but less. This is the sixth post in a series on Christian approaches to bioethics, written to accompany a sermon series on the subject at Wellington South Baptist Church, and to expand the discussion to the rest of the Sacraparental community. Crisis Pregnancy: Are You an Unborn Baby’s Neighbour? Please feel free to comment below with your own thoughts. Our society seems besotted with death. Either in abortion, euthanasia, or in the material that we have in entertainment where murders and violence are commonplace. It can’t be healthy for our spiritual wellbeing to focus on death rather than life. I was thought it was an interesting lecture on Sunday, and I agreed with almost everything you said. But I was struck by two things. The first was that it was an interesting lecture more than a sermon. Perhaps it is an arbitrary distinction, but what I have in mind was the very light dependence (at least explicitly) on either Scripture or the 2000 year old Christian tradition/teaching. In the latter respect, at least, very Baptist. But, more importantly, the contrast to your preaching on abortion was very striking. Running through your case for opposing allowing euthanasia, I think every one of the points also argues against the legalisation of abortion. Indeed, I would argue that the case is rather stronger in respect of abortion since although some people who would undergo euthanasia might be, in some respects, do so involuntarily or under pressure, every single child aborted was done so without their consent. And, turning the argument around, I could run to you the line you ran to me on abortion: rather than focus on the law we should focus on creating a climate of hospitality in which no one feels the need/pressure to undergo euthanasia. You were talking to a church congregation, but I struggle to see many of your arguments (which, to repeat, I agree with) getting much traction with an overwhelmingly secular public. The “slippery slope” arguments might have some appeal at the margins, but I think this is an issue on which the church – and the standards of Christian culture to which we have tried to bear witness for centuries – has already lost. Will euthanasia become legal in 2015 or 2020? I don’t know quite when but – without some dramatic revival of faith – it is almost certainly going to happen in New Zealand. Why would a society so ready to accept 14000 abortions a year deny its members the freedom to choose the time of the ending of their own lives? I suspect that in 20 years time, people at the relatively liberal end of the evangelical spectrum will be running the hospitality argument in respect of euthanasia, while trying to avoid arguments about law and public policy. I agree that there are lots of overlaps in arguments when it comes to abortion and euthanasia. You may recall that on Sunday I made the point that I don’t think it’s an either/or choice when it comes to focusing on public policy and law or focusing on community responses of hospitality. For both issues I think you could do two sermons – one on the law and one on the personal response. As I said on Sunday, I chose the focus I did for the sermon series because I think the church has lost its way in meeting the needs for hospitality for families in crisis with an unplanned pregnancy. We have a long heritage of offering radical hospitality and we need to recover the calling to fill social gaps. In contrast, the church already spends a lot of energy, around the world, on opposing abortion laws. I think I was right in thinking that the role of hospitality would be a new thought for a lot of people when thinking about the issue. I agree that a community response of hospitality is an important part of addressing desire for euthanasia – as I say at length in the blog piece and in the sermon. Supporting high quality hospice care, offering ‘dignity therapy’, caring for people who are feeling lost and lonely at the end of life – all extremely important things. I’d like to push back on your assertion that my sermon on Sunday was a lecture that didn’t draw enough on Scripture or tradition. I am on your side – I think that preaching should be preaching, and grounded clearly in the Bible. I’ve been building a case for five weeks that Genesis 1:26-27 is foundational for a Christian approach to bioethics, and drew on that further for Sunday’s sermon, as well as the other texts we have focused on through the series, like 2 Corinthians, Matthew 25 and Luke 10. But the euthanasia sermon was very much a ‘topical’ sermon, which for any congregation committed to hearing from Scripture in the form of preaching makes up a minority, but an important minority, of a year’s preaching. A topical sermon addresses a subject not directly dwelt on in Scripture and draws threads together from the big story of Scripture to shed light on the subject. I believe that topics like euthanasia and abortion are important for Christian congregations to discuss together in a church setting, so I make no apology for doing so in a ‘topical’ format, since they are not subjects where a single passage of Scripture can tell us everything we need to know or talk about. Having said that, I’d say that the first sermon was an expositional sermon on the Genesis, and the disability sermon was in part an exposition of 2 Cor 4. As for whether any of these arguments will be convincing for a non-churchgoing audience, let’s see! A lot of readers of this blog are not churchy, and I hope we’ll hear from them here. But it is clear from research that the more information people have, the less likely they are to support the legalisation of euthanasia, so that’s why I’m trying to speak to both audiences. Thanks again for following so closely! Of course, New Zealand Baptist churches have done almost nothing opposing abortion laws. It has largely been left to the Catholics and, in more recent decades, in the US denominations like the Southern Baptists. But I wasn’t really trying to extend that debate. On sermons vs lectures, I thought your first 4 messages fitted the “sermon”: category (by which, of course, I don’t mean just the exposition of a single passage). I think the question all preachers face – in a way that lecturers or participants in a debate don’t – is that of “by what authority does s/he speak”. I did a lot of preaching in my younger days and still reflect on that issue. I guess it is what makes me uncomfortable with the Baptist ethos: Baptist sermons done well are solidly grounded in Scripture, but can too often by an idiosyncratic individual take on (or use of) a text. And mostly there is a reluctance to invoke or engage with the teaching tradition of the worldwide (2000 year old church). But thanks for the five stimulating messages. I haven’t heard this series (am in the wrong time zone), so i’m referring broadly to preaching. Am tempted to swap war stories as to the worst thematic series attended (not suggesting in the least that this series is bad at all – certainly sounds interesting from the material posted on the blog) but it wouldn’t edify anyone or help anyone. Prior to joining our current church I had mostly attended Baptist churches for the previous ten years plus. Not every sermon is going to be mind shatteringly and life changingly amazing, but each should illuminate part of the scripture and part of what God wants us to know. I used to listen to the podcasts from Wayne Grudem at the adult education class he led at the church he attends, and they dealt with thematic issues almost exclusively. Don’t 100% agree with where they land, but an upside is that people can get a handle of thematically important things while leaving the pulpit open to keep the focus tightly on the text and showing the congregation how it all fits together as a book and within the overall arc of redemptive history..
One of the most memorable series I’ve sat under went through Judges, where the preacher emphasised again and again how Israel went through the same cycle of failure. Thanks for this post. I was interested by your description of ‘dignity therapy’, and the way its use has led to fewer people seeking euthanasia. PS if it wasn’t clear which Anna was our mutual friend, she knows you and your husband from the Tab, where he (or you both?) were in her homegroup. I’m avoiding using surnames as I never use my own on the web (for my safety, as I write a lot about my physical vulnerability) so it seems a bit off to use hers without checking first! Thanks again for this, Kiwienzian. I really appreciate the interaction, which I know is costly. Yes, the broad definitions in this bill are troubling to me too. Thanks for the clarification re Anna S! Hi Thalia – am following this with interest and completely in agreement with most arguments against legalising euthanasia (possibility of abuse etc.) – however the statistical argument gives me pause… ‘You may be surprised to learn that very few people who request euthanasia are doing so because of physical pain. Only 7% in one Oregon study, and none at all in an Australian study’ – one person in your family in physical pain who requests euthanasia is 100% of the study you are doing at a personal level. How many individuals were included in that 7% in Oregon? How did their families categorise the person’s suffering? Yes, that’s a fair call, and it is a bit cold to talk about statistics which represent individuals in suffering. Palliative care doctors say, publicly and repeatedly, that with adequate funding there is no need for anyone to be in pain as they die. A doctor friend made that point on my Facebook page again today. One person in unbearable pain is a terrible, terrible thing. I guess the question is – what is the solution to that pain? Somewhat (but only somewhat) concerning The New Zealand situation and Maryan Street (see above) … here’s a shaggy dog story at the very edge of the issue … so much at the edge of it, it is another issue. While not wishing to put anyone’s pot on to boil — How could this do that anyway? — and while not wishing to identify some or other anti-euthanasia stance as being straightforwardly, un-problematically “Christian”, I, however, often find myself head-scratching concerning the evolution, during a lifetime, of persons — evolution in terms of their attitudes, beliefs, commitments, and self-understandings. Maryan Street is one such person who perplexes me in that way – a bit like onetime evangelical, Bart Ehrman, does; Ehrman is now an academic “evangelist” for the view that the roots of Christianity are not to be found in the Jesus of history [sic], but in ahistorical gnosticism. Back to Maryan: she has a profile of being no sympathizer with orthodox Christianity, certainly not evangelicalism, even in its informed “incarnation”. Maryan is also quite well-known among feminist and the LGBT community for having a really, really, good, strong, contralto singing voice. She is fantastic! Well I, and not a few others, remember Maryan in her Victoria University of Wellington student years, in the early 1970s, singing. Then she fronted what she has called a “student band” – Graeme Potter (drums), Geoff Keith (bass), Ashley Lenhert (guitar), Maryan Street (vocals). ‘ Ms Street, who plays clarinet and guitar, is also a fine singer. As a teenager she sang in a youth nightclub, the Blueroom – held in National Party rooms. She also sang in a rock group at university. Okay, – drum roll!!!! – the name of the band was, “Maranatha”. The band wrote and performed their own original “Jesus people” songs. The bassist, Geoff Keith, was the national traveling secretary of the Tertiary Students Christian Fellowship. Maranatha was quite a feature in the then very energetic expression of Christianity and the arts at VUW, and about Aotearoa New Zealand campuses in general. I’ve been to a few prayer meetings in which Maryan participated. Great fun to read your story and commentary, Gavin! Back to the present, it seems Maryan Street has not made it back into Parliament, so I’ll be keen to hear if other Labour MPs will be adopting her Private Member’s Bill in the next term… If anyone has inside info, let us know! This is, of course, far from “inside” insight, but my guess is that someone of liberal Labour (in marked contrast to long-defunct socialist Labour) will take up her cause. But now come with me on another, I think relevant, journey – an exploration of some historical changes and a forgotten thread that yet runs within the changes which, among other things, problematises the relation between the left and pro-life concerns, a problematic that is framed by another, the relation of socialism to Christianity. Labour and the issue of what is called pro-life concerns is an interesting matter. The wider frame of that matter is the issue of the relationship – or lack of one – of pro-life concerns with socialism. In my teens (the 60s) I knocked around with some then Maoist Marxist contemporaries of mine, two of whom were to become pragmatically several shades less than fully red as he and, quite a lot later, she entered the mainstream political arena. One became a long-standing Labour parliamentarian and the other became a Green parliamentarian; they were together in Helen Clark’s government. But from that formative time of youthful idealism, I’ve not ceased to wonder why the leftists of my generation were not, for all their trumpeted humanism, more consistently pro-life … I wondered then even though I was not a Christian. The human rights of North Vietnamese peasants, children, women, and men – who were napalmed and in other ways butchered en masse by the US military machine – were known to be sacrosanct. Rightly, we young leftists knew that the humanity of each baby butchered by Company C of the United States 23rd Infantry Division, in the Mỹ Lai massacre was sacrosanct. The butchery was the ultimate violation of persons. But the same leftists, who knew that about Mỹ Lai, touted “a woman’s right to choose” with equal apparent moral fervour … Hummmm? Over my lifetime socialist Labour has died; and the Marxism that inspired a significant sector of the early Labour movement has been shown by Soviet, Chinese, Kampuchean, etc. communisms to have had feet of clay; though, to misquote Chesterton, arguably Marxism has not been tried and found wanting; it has been found difficult and not tried. In Aotearoa New Zealand, socialist Labour began to show major signs of dis-ease after the untimely death, in 1974, of Norman Kirk, Prime Minister of the third Labour government. Subsequently, after many years of Rob Muldoon’s National government, David Lange (PM) and Roger Douglas (Minister of Finance) – in the fourth Labour government (July 1984 to November 1990) came to power. But the fouth Labour goverment thanized – without anything “good” (Gr. eu) about it – Labour’s very sick socialism. Douglas lethally adopted, lock stock and barrel, monetarist economic rationalism, the “market economics” propounded by Milton Friedman and the Chicago School. The Tory Prime Minister, Maggie Thatcher, was doing the same in Britain. Lange let Douglas dismantle the welfare state, privatise major state assets, deregulate the market and pursue “free” trade (a.ka. make sure Aotearoa would be run, thenceforth, by international corporate capital, rather than democratically by New Zealanders) … etc. Not a few (of us) who worked for the election of Lange’s Labour felt utterly betrayed. Thus, gutted the Labour Party’s corpse was colonised and supposedly revivified by social liberals, people with other than core socialist agendas – Maryan Street has been one of them. Of course, I’m not saying that socialism has nothing to do with the promotion of the social inclusion of marginalised minorities – heaven’s above, no! And I hope it is obvious that I’m not saying that the inclusion of humanising agendas is not a major aspect of socialism. But call me an old modernist with somewhat traditional Marxist inclinations if you may, socialism is a universalism and, like Christianity, it is precisely because of its universalist scope and humanising vision that socialism must – like Christianity – be radically inclusive. But that doesn’t mean that the central vision should be taken over by non-universalisable, though importantly-included, sectional interests. The western church – read Catholic and particularly Protestant, in distinction to the Orthodox – is a stark witness to splintering and factionalisation whereby what is ultimately non-core, though still important, drove wedge after dismembering wedge into the body of Christ. Something similar has been happening in Labour. Strident voices on the margins have displayed fundamentalisms that would each ultimately usurp properly visioned unified orthodoxy. One-trick pony liberals express surprisingly narrow fundamentalists of their own sort. These days mostly atheist, agnostic, neo-animist, neo-pagan takes on ultimate concern characterise “middle New Zealand”. Therefore, those takes – united by one factor that they are not Christian – characterise the diverse collection of people who go in for, go into, our contemporary politics. Labour today very much reflects such a post-Christian/non-Christian profile. But the first Labour government – 1935 to 1949 – of Michael Joseph Savage (PM), Peter Fraser (PM), Walter Nash (PM), the Reverend Arnold Nordmeyer (Minister of Finance to Nash) was both way, way, left of centre and hugely Christian in its leadership. With the possible exception of the less strident, but Presbyterian, Fraser, the Savage, Nash, and Nordmeyer triumvirate – along with not a few others in the parliamentary and party leadership of Labour, such as Harry Holland – evidenced clearly and unashamedly Christian motivation in the way each personally justified his socialist beliefs and Labour’s programme. These were people of personal Christian faith. AND, on the matter of the “sanctity of life”, Arnold Nordmeyer was consistently an implacable opponent of the death penalty, and a patron of the Society for the Protection of the Unborn Child (SPUC). A conversation between Arnold Nordmeyer and Maryan Street about ultimate matters would be a very interesting one! It’s interesting too that Continental post-structuralist philosophy – having become detached from modernist totalising meta-narratives – has long been seen to have consequently taken a “turn to the religious”. But what is the cost of postmodernism’s much-touted deconstruction of totalising meta-narratives? The resulting extreme relativism means that all “isms” including Christian-ism, Islam-ism, capitalism, sexism, neo-Nazi-ism, etc. are apparently equally valid. So socialism is just as much an individual preference as captialism; socialism is no better and no worse than capitalism or fascism or Christianity. Postmoderism validates everything because noting is universal and therefore contradiction may happily reign universally. But where does that leave Continental neo-Marxism? Where does extreme pluralism and extreme relativism leave Continental post-structuralist neo-Marxist philosophers such as Slavoj Žižek and Alain Badiou? Surely the truths of socialism are truly universal – Michael Polanyi (sadly not a leftist) rightly contends that we hold all our beliefs, corrigible as they are, “with universal intent”. Surely, for the socialist, the true unity of humanity qua humanity cannot be balkanised into a multiplicity of local and competing tribal contentions. Surely, humanity is truly human when humanity is cosmos, rather than chaos. The likes of Žižek and Badiou pointedly hold it to be true that true humanity is incarnate only in the cosmo-polis. So then, what of cosmopolitan humanity, wherein diversity yet holds together in a single, overarching, unifying, ecologically-ordered, humanising polis? Indeed, where are the roots of the western cosmopolitanism that humanised the world? Yes, it is these questions that atheists such as Žižek, Badiou, and l’enfant terrible de la philosophie française, Quentin Meillassoux, with not a few other leftist Continental philosophers are asking. In discernibly different ways the same answer that Žižek and Badiou, Giorgio Agamben give to these questions is “Saul of Tarsus, a.k.a. Paul the apostle to the Gentiles. These philosophers champion Paul’s understanding of Christ’s resurrection as the radical rupture that breaks open the world, creating a transforming, humanising, cosmopolitan unity-in-diversity that re-structures reality! Sound familiar? The left can only be left in light of the gospel. I wish Maryan Street got that as Walter Nash and Arnold Nordmeyer did …. P.S. I will stop lecturing now! My wife has given me orders!!!! So, I pray that if there be any further posts from me they will be brief, to-the-point, offerings! Lord help me! This is my submission on the subject of assisted dying in New Zealand. ‘It is a tragedy when the human spirit dies before the body. But the answer is not to kill the body too, but to revive the spirit.’ So said Canadian legal academic Prof Margaret Somerville at a conference on euthanasia held in Wellington a few of years ago. In this submission I will outline why I think legalising euthanasia will have far-reaching unintended effects and is a poor solution to the problem of end-of-life suffering. I want to acknowledge that everyone arguing for or against legalised euthanasia is on the side of reducing human suffering. We just disagree about how to do it – and what effect on human suffering euthanasia will actually have. But it’s also true that very few people who request euthanasia are doing so because of physical pain. Only 7% in one Oregon study, and none at all in an Australian study (Emanuel, 2005). A Dutch study showed that half of all people requesting euthanasia were clinically depressed (Emanuel, 2005). Indeed, a Canadian study found that rather than euthanasia, a very effective response to such requests, along with medical treatment of depression, was what they called ‘dignity therapy’ (Chochinov, 2005). It’s a specialised psychotherapy where volunteers listen to and write down a person’s life stories, then present them to the person to bequeath to their loved ones. The next biggest argument is certainly about freedom of choice. Shouldn’t people be able to choose and control when and how they die? Like many others, I’m not that interested in using the law to limit people’s freedoms when they don’t affect other people. But in the case of euthanasia, one person’s freedom is another person’s shackle. Even in the Netherlands, where euthanasia is readily available, and reported deaths by euthanasia make up around 3 per cent of all deaths each year, the majority of people still do not choose it (Remmelink Report, 1990). Most people, even in the Netherlands, would rather that the time and method of their death be out of their hands. Yet, not only are most people requesting euthanasia not in physical pain, it’s also true that since euthanasia was legalised in parts of Europe, targeting that kind of scenario, a lot of people have been killed in circumstances that are very different (Pereira, 2011). For instance, both Belgium and the Netherlands have, on paper, strict rules on mandatory reporting. But in the Netherlands, officials estimate that over 20 per cent of cases of euthanasia remain unreported, and in Belgium the figure is more like 50 per cent (Smets, 2010). More importantly, both countries’ legislation requires voluntary consent by the person who wants to die. But in the Netherlands, 14%, or one in seven deaths by euthanasia are now without consent or an expressed desire for it (van der Heide, 2007). In Belgium, 32% of deaths by euthanasia happened without a specific request (Chambaere 2010). § ‘The Groningen Protocol’ is an accepted medical practice – not legal under the euthanasia laws, but openly practised and no one has been prosecuted – whereby severely disabled Dutch babies are killed at the request of their parents (Pereira, 2011). § Doctors in Europe now perform euthanasia on middle-aged people in the early stages of dementia (Pereira, 2011). § In Belgium, Parliament has now extended euthanasia to those under 18. § In two widely-reported Belgian cases, people without a terminal illness have died by euthanasia because they, essentially, thought they had nothing to live for. The people involved would be described as suicidal if euthanasia weren’t an option. § Belgium has also seen cases of euthanasia for blindness and anorexia. “Over the past two decades, the Netherlands has moved from assisted suicide to euthanasia, from euthanasia for the terminally ill to euthanasia for the chronically ill, from euthanasia for physical illness to euthanasia for psychological distress and from voluntary euthanasia to non-voluntary and involuntary euthanasia. Far fewer terminally ill people want euthanasia than we may think. Far more people are at risk of dying against their wishes than we may realise. I wish you all the best for your deliberations.